Finding alternatives to soda and sugary beverages might be one of the best things you can do for your health. Research has shown the negative effects of sugar on our health, and sugary drinks have been linked to weight gain, especially in children. It is suspected that weight gain occurs from consuming sugary drinks because the body is unable to feel satiated from sugar in liquid form—these calories go ‘unnoticed’ by the body, leading us to consume more. The fact is, there is little to no benefit in consuming liquid calories from sugary beverages such as soda and fruit drinks. In a pinch, add some lemon and lime with fresh mint to your filtered or mineral water. This takes no time at all and transforms water from ordinary into truly refreshing. Grate in some fresh ginger for a little added health benefit and zing. Try combinations blackberry-mango, strawberry-kiwi or watermelon-cantaloupe. The possibilities of flavour are endless. To increase the flavour profile you can make a quick puree of fresh or frozen fruit with herbs. Add 2 tablespoons of puree of your choice into a cup of mineral water. Try lemon-basil, blackberry-ginger or strawberry-mint. 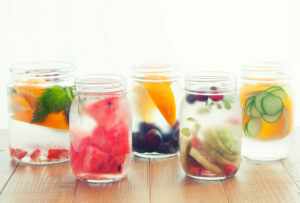 If you are drinking fruit or cocktail juice regularly, try diluting it with some water as there is a high concentration of sugar in juice that you just don’t need. N Engl J Med. 2012 Oct 11;367(15):1397-406. doi: 10.1056/NEJMoa1203034. Epub 2012 Sep 21. A trial of sugar-free or sugar-sweetened beverages and body weight in children.